It's been a while since my last instructable, so I thought I'd jump back in with something tricky. I saw a pic of this on the internet somewhere, i think it was originally done by Dirk Eisner. The folding on this model is really simple, but the weaving is extremely hard! Just the kind of stuff I love. More time making the puzzle, less time making the pieces. Follow the pictures. These folds give us a 45 degree angle. Repeat at the top. Fold the left side of the paper to the middle, and form a pocket by reversing where the (new) left edge meets the 45 degree fold. Repeat on the right hand side. I will leave the weaving as a puzzle for the dedicated folder to figure out. Thats all I had, if I can do it so can you! Good luck, and enjoy the challenge! another incomplete indestructible? please, finish these..
also, this is not your work. 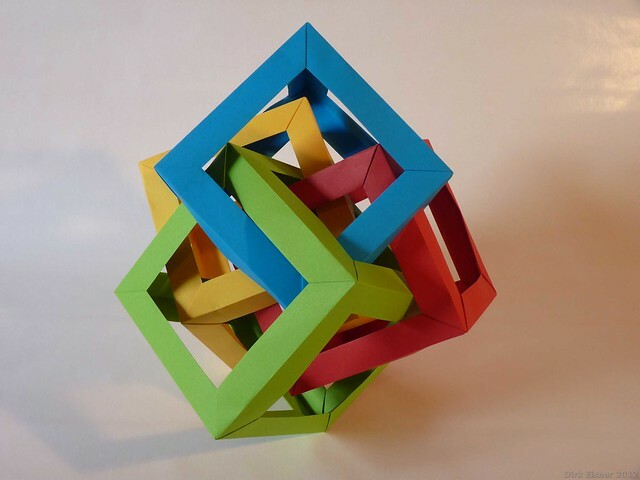 a COMPLETE version of how to make these cubes can be found in 'Unit Origami: Multidimensional Transformations' by Tomoko Fuse. not this specific intersecting pattern, but she does show how to make them into a chain. And the folding is my own work, I couldn't find a resource on how to make a 90 degree angle at the time so I worked out the folds myself. I wouldn't be surprised if Tomoko Fuse did it as well; I know one or 2 other folders (Byriah Loper, Dirk Eisner) also came to this fold, it's probably the simplest method of getting an 90* angle (but not the only one). It is a puzzle after all :) Though maybe at least include a link to some hints for those who might have trouble constructing it. I would if I could, unfortunately I don't have any more resources other than the pics (the links in the last steps). I found those very useful, as you can see the different colours and how they fit together better than one can with what I used (a single colour). Oh well. I haven't actually tried it out yet, but it looks very cool, so I think I will try. Good luck! Post a photo if you manage! 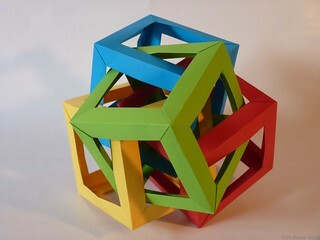 You should look very carefully at the photos and try to understand the way each cube intersects each other one, the rules for each intersecting pair will be the same for each additional cube. Finally got around to start trying this! :) It took me awhile to figure out how to fold it, your comment below to leea9 helped though. Now I'm just stuck trying to fit three together, I can see how it works, but it's difficult to slot in the third. I got the first three steps no problem. The fourth seems to be just crease and open. But I can't tell how you got from the fourth to the fifth. The dark color of the paper make it hard to see the shadows and so I can't replicate the image in step five. I can make the shape but it doesn't have the fold lines I see. Ah yes step 4 is just creasing and unfolding. Step 4 is not entirely necessary, all it does is it makes the flaps sit neater in the pockets. Step 5, once you have creased your flaps, is fold the entire piece in half again lengthwise (then unfold, not shown), like you did in the first step. This creases the pockets and helps the model to sit neatly together. 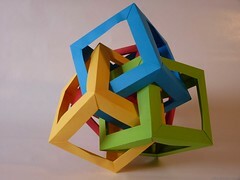 That's cool :) How do you interlock the pieces to get a single cube? stick the flap of one piece into the pocket of the next, the angles that are made will be exactly 90 degrees.